The Automatic Black Walnut Cracker is one of the fastest walnut crackers on the market. 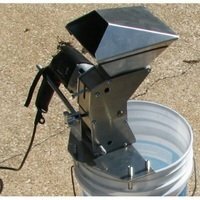 Fill a 5-gallon bucket in just 5 minutes! Ideal for black walnuts, the Automatic Black Walnut Cracker is also great for cracking filbert nuts, hazel nuts, English walnuts and more. Made in America, the Automatic Walnut Cracker is very easy to use and very efficient. Attach a 3/8" or 1/2" variable speed drill and then simply drop the nuts into the machine. In no time you will enjoy the fruits of your effortless labor. Hardened steel forms the cracker and floating anvil so that the Automatic Walnut Cracker will withstand years of use. The Automatic Walnut Cracker applies the perfect amount of pressure to the nut so that the shells do not end up in tiny fragments. With other nuts like almonds and pistachios, you can expect the machine to extract about 80-90% of the nut meat, but that's quite a yield for the little energy that you exert. The Automatic Walnut Cracker is NOT for soft shell nuts like pecans.